Is it just me or do you also think there are a lot of classic, rod and custom events on year round these days? Each year on www.classiccargurus.com.au I seem to put up more events and on some weekends through the year there are multiple events in the same city. The outcome can only result in a few scenarios – car owners and spectators alike will be more selective and the organisers will really need to promote their events well and offer numerous points of differentiation to make their event stand out. 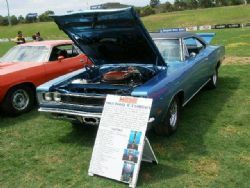 These conclusions came to me on Sunday after visiting the American Car Show at Rat Park on the northern beaches of Sydney. I have been to this show for the last five years and three years ago it was sensational. Last year attendance was down and it would rate a low average and this year there were fewer cars again and even fewer people. I personally like the format – charge the spectators, offer lots of good trophies to the car owners with only a gold coin donation entry and all proceeds go to a nominated charity. Even though numbers were down, the quality wasn’t. What was on show was top shelf with mainly high end street driven cars on display. 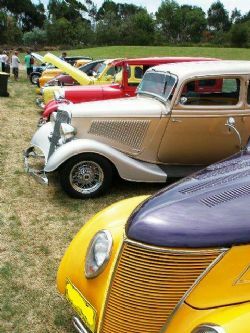 The Northern Beaches Hot Rod club had a strong contingent as usual and a smaller number of members from the Corvette and Mustang clubs in NSW turned up. 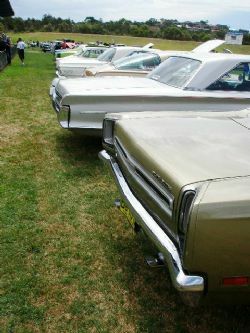 Mopars were well represented and some even came down from the Central Coast which was pretty amazing given the Central Coast Show n Shine was on the same date. Vintage and veteran vehicles were proudly displayed on the oval and there was a very sweet original 32 Ford roadster that got my pick of what I would want in my garage out of the oldies category. Cadillac’s, Chevs, Pontiacs, Buicks and others could be viewed as well but the numbers were light on compared with previous years. My overall pick of the show was looking to be a blue 57 Chev four door that was tricked out nicely, that was until I spied the RT Challenger with a 426 Hemi on the oval that had a full nut and bolt five year restoration. 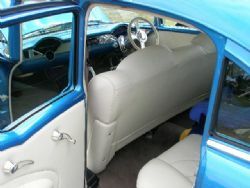 Absolutely stunning original condition, great colour and surprisingly for sale. I would expect a car like this to be in the six figures however to attract a buyer in today’s market I am not sure the owner would get back what he put into it. A number of the US magazines I subscribe to are finding numbers down at events due to loss of interest, older owners tired of the same old thing, costs (including getting there and back) and the time it takes when you have to hang around all day. I think organisers of events need to have a long hard look at what they are doing, what other events will clash with theirs and think outside the square and promote like crazy. I hope they can reinvent and invigorate their car shows because a good one always leaves me smiling and dreaming of what could be next in the garage.